FACT CHECK: Will the Senate Election Be Delayed by Governor Kay Ivey? FACT CHECK: Will Alabama Governor Kay Ivey Delay the Senate Election Due to Roy Moore? Home » Fact Check » FACT CHECK: Will Alabama Governor Kay Ivey Delay the Senate Election Due to Roy Moore? Claim: Will there be a delay in the special election for the United States Senate in Alabama? Could the Alabama Senate Race Be Delayed? A special election for the United States Senate in Alabama is set for December 12, but some Republicans want to delay the vote. This election is to fill the vacant seat of former Senator Jeff Session, who took a role in the Trump administration. The successor of Sessions will hold the senate seat until January 3, 2021. In the running for this senate seat is Democrat Doug Jones and Republican Roy Moore. The potential delay of the vote is due to Moore is facing accusations of sexually harassing and/or pursuing relationships with minors approximately 40 years ago. The Republican Party (the GOP) is not waiting for this news to disappear or for the issue to be resolved quickly. It is said that some Republicans want the vote to be delayed in order to buy time and remove Roy Moore’s name from the ballot. By taking this route, the Republican Party would be able to put forward a different candidate and protect the party’s reputation. Why Doesn’t the GOP Just Remove Roy Moore’s Name? The Republican Party cannot simply decide when to add or remove a candidate from a ballot. Presently, the State of Alabama requires that—in order for a candidate’s name to be left off a ballot—the candidate has to officially withdraw from the race at least 76 days before the election takes place. This rule results in more stability and organization during election races. How does this 76-day rule apply to this special election for the United States Senate in Alabama? With the vote set for December 12, a candidate would have had to officially withdraw on or before September 27 in order to keep their name from appearing on the ballot. The 76-day period between September 27 and December 12 can be considered a lock-in period. The details of the first accusations against Moore came out on November 9, 2017, meaning that, if a delay had been requested and processed immediately, the vote could have been pushed to January 24, 2018. So far, no delay request has been made. How Could a Delay Happen in the Special Election? In order for there to be an election delay, Alabama Governor Kay Ivey and the Republican Party would have to get the approval from Washington. Before going ahead with this process, it seems that Ivey is working to get the support of President Donald Trump and Vice President Mike Pence. This would make it much more easier for an election delay to be processed. Will Trump Buck the Establishment and Support Roy Moore? What Could Happen to the Special Election Set for December 12, 2017? Moore has come out and said that he did not commit the actions of which he has been accused. One of the women who spoke out against Moore was Beverly Young Nelson and, since then, more woman have spoken out about similar experiences with Moore. 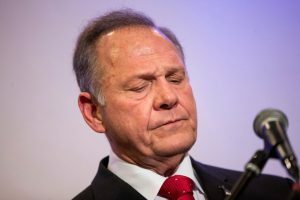 Currently, the allegations that Moore sexually harassed minors have not been proven, but they could become a larger issue. The accusations could result in trials or a deals behind closed doors. If Moore does step down, the Republican Party would not have an official replacement candidate. By default, Democrat Doug Jones would win the election. It is possible that a Republican write-in candidate enters the special election. The State of Alabama does not require write-in candidates to fill in the same documents that official candidates have to submit before elections. One possible name is Luther Strange, who lost the Republican primary race to Moore. Alabama does have a “sore loser rule,” but it doesn’t apply in this instance. Normally, Alabama doesn’t allow primary losers to run in a general election under the banner of another party. It does, however, allow a primary campaign loser to participate in the general election as a write-in candidate. Behind the scenes, Strange could be gaining support, and he might give the Republican Party a better opportunity of winning the special election. The reason why Strange could be chosen as a write-in candidate is that he had been endorsed by President Trump and some Republican Senators when he was running against Moore in the primary. The race could remain as it is now; the vote would occur on December 12 as planned. Then it would be up to the voters to decide whether Moore or Jones will become the U.S. Senator for Alabama. Can the New NRSC Poll Showing Moore Down 12 Points Be Trusted? FACT CHECK: Was Roy Moore Signature on Accuser’s High School Yearbook Forged? What Happens if Moore Wins the Special Election for the United States Senate in Alabama? There are two possible outcomes if Moore wins the special election. The first outcome is that there is no lasting negative impact on Moore. It is possible that the allegations disappear and his political career moves forward. The second scenario is that Moore wins the special election and the allegations continue to become a larger issue. This could result in trials or out-of-court settlements. If Moore is found to be legally guilty (or enough of the public considers him to be guilty), he could end up losing his senate seat before his term is up, possibly leading to another special election. No matter whether Moore is found to be innocent or guilty, some damage has already been done to his reputation (and to the reputation of the Republican Party). The Republicans want the issue to move out of the front-page news as quickly as possible. This is why the Republicans are considering applying for a delay of the special election. The best situation for the Republican Party is to control the situation as much as they can, and to get a new candidate in place in time for election day. One of the party’s fears is that many Republican supporters may be turned off by Moore, and could switch their vote to Jones or a smaller candidate—or not vote at all. By delaying the election process, it would give the Republican Party some hope for victory. With weeks left before the special election, if the vote is not delayed and Moore remains the Republican candidate, Jones and the Democratic Party could use the allegations against Moore as campaign strategy, attacking Moore’s character and gaining the trust of the voters. That could result in a Democrat victory.